It's a simple salad. Three ingredients the way I make it. Fresh arugula -- and these are so baby crisp, so darkly green and tender, plucked from the farm only last Saturday. A good aged Parmiagiano, a hardy, hearty block slightly oily in my hands, its scent familiar and comforting if not as mephitic as I normally like my cheeses; and a simple little lemon, bright canary yellow, firm and plump. Toss the arugula with the zest and juice of half a lemon. Shave Parmagiano on top. The arugula is peppery. The cheese is tangy, hard to cut through, with little give. The lemon zest and juice are tart and acidic. This is a Bad Mood Salad. Chew. It's bitter. Chew chew chew. Sharp and wince inducing. Chew and swallow. It prolongs and teases out the things that enrage you, fills you with a sense of futility, makes you ponder, "What's the point?!" Bitterness. Taste. Figuratively or literally? A family friend recounts the night he realized that he and his fifth column had failed in an attempt to overthrow a corrupt and unstable government; and realizing he was alone at the rendezvous point, he recounts: "All I could taste was that bitterness throughout my mouth." And then from outside the safehouse, the stentorian tones of the men who had come to arrest him telling him that he was alone and that his friends had not come. "Bitterness." "I feel so bitter," says a friend after the throes of a marital spat, her voice catching. "Why can't he understand what I want?" Oh. We've all felt that sting before. We yearn to be the sun in your Copernican universe. Knowing we are loved is not the same as feeling we are loved. If you can set aside the Ptolemaic principle in which you are the Earth, we can give you a warm sun around which to revolve. It's much more pleasant than a blazing, blistering satellite intent on burning you to a crisp. Bitterness is tasted in the back of the tongue. Is this why you swallow bitterness? Every night I cut out my heart. Sometimes I get fancy and melt the Parmagiano to make a cheese crisp. Then I'll find some bacon and throw that in. And by that point, I'm not really in a bad mood any more. Sam of Becks and Posh came up with a challenging and really fun theme for the 19th edition of Is My Blog Burning? : Vegan - make an amazing dinner without using any animal products. It's not as easy as it sounds. Vegetarian is relatively easy; but vegan requires thinking. It's so easy to slip. I was doing great through the second course. But for the third course, I made an unrecoverable boo-boo rendering this meal less-than-vegan. I stopped by the Vietnamese grocery store because I needed vermicelli for the stir fry and a few other items. Perusing through the fridge, I noticed some fresh lo mein noodles -- hard to come by in these parts, so I picked up a bag. Then I went looking for jicama. Do you know how hard it is to describe to the clueless grocer what jicama is when you don't even know what it looks like? Thank God for identifying stickers on fruits and vegetables. When I got home, Hubby asked me if I needed help (earning major brownie points), so I asked him to prep the veggies. As he was cutting up vegetables for the stir fry, Hubby suddenly paused and said, "Is this a vegetarian meal?" Another pause. "Oh God! Is this a vegan dinner?!" "YesbutpleasedonttellJason." It came out in a rush. "Oh God," he said again, ignoring the Second Commandment. But I can understand: his last vegan experience hadn't been a fun one exactly. Jenn & Jason arrived and I began making the Jicama and Basil rolls, serving appetizers on the fly at the kitchen counter. The second course is one of my favorite Vietnamese dishes and the one inspired by Heidi: banh xeo, also known as Sizzling Rice Crepe. It's a rice flour crepe (distinctly yellow from the addition of turmeric) made with non-glutinous rice flour, coconut milk and water, folded over a savory shrimp, pork, bean sprouts, scallions and mung bean mixture, and served with a tangy fish sauce vinaigrette. Omitting the shrimp and pork, I made a version using tofu, mushrooms, bean sprouts, and scallions (I forgot the mung beans in my mental fog). It came out quite delicious although the crepes weren't as crispy as I would have preferred. Instead of the fish sauce vinaigrette, I made a chili-hoisin-coconut milk sauce which went perfectly with the crepes, providing it with a nice punch of spicy sweetness. The third course was to be a vermicelli vegetable stir fry using clear vermicelli noodles and a gorgeous mix of vegetables including cauliflower, sugar snap peas, black mushrooms, carrots, celery and onions, tossed with a sesame soy sauce. I went to finish the stir fry by adding the noodles and mushrooms. And therein lies the Big Mistake. Remember the lo mein noodles? Well, I reached past the cooked vermicelli, absentmindedly grabbed the lo mein, and tossed it in with the veggies. I brought it out to the table, served everyone and proceeded to eat happily. About halfway through my dish, I suddenly stopped and blurted, "Oh no." I couldn't believe it. I'd been so careful. I had made substitutions left and right. But I had failed. "These are egg noodles." "It's still vegetarian," Jenn said. "Yes, but for my purposes, it's not..."
Jason was eyeing me. "Was this a vegetarian dinner?" Hubby (simultaneously): "More like vegan, actually. Except for the egg noodles." Then, ever the life preserver: "She told us not to tell you." Ack! Apparently "In sickness and in health, for better or for worse," is up for grabs when your 6'1 buddy has just discovered that your wife tried to pull a culinary fast one. Jason: "I knew that was tofu in the last dish! I kept thinking, 'That looks like tofu! I know it's tofu!'" Casting a meaningful glance at his wife, "It's not like I don't have tofu in my fridge once a week." Having flubbed the third course, I knew there was no way to disguise the dessert for being anything other than what it was: tofu with a ginger caramel. Hubby refused to eat it, citing texture issues. A news flash for me, not unlike the Lent episode because really, the man has no texture issues. I didn't even try to pass one to Jason now that my cover was blown. Plus, he's not a dessert guy. Jenn and I ate instead. Me: "Did you like it? My feelings won't be hurt if you didn't." Maybe the more telling sign is that I'm alive. Partial success at the very least. I was so bummed about the egg noodles. I mean, the vermicelli was there and ready to go! So I don't think I could claim this was a vegan meal. This really was an awesome IMBB; I wish I could've done it justice. Ah well. I'm just going to have to do this again. Last night I dreamt I ate a salad. This tells me I'm not eating enough greens. I only dream about food if I'm craving something and salads aren't high enough in my preferred food chain to desire in real life. However, my body is much smarter than my brain so it's clearly feeling a deficiency. I love (and eat) legumes and vegetables, far more than salads, but the crisper is bare, mocking all pretense of a well rounded diet. When Hubby is home, I'm pretty good about including leafy greens and vegetables (for his health as much mine) in our diet. When he is gone, as he is currently, I find myself reverting to bachelor behavior: whatever's easiest to make is what I'm going to eat. My friend Greg asked me a few days ago if I continue to cook and eat well when Hubby is not home; I said yes. It's not a quite firm yes; there are caveats. I don't eat junk food (actually, the last time I ate McDonalds, I called up Dani sobbing uncontrollably because I had deliberately used food to fill an emotional void, which, as she pointed out, is a perfectly American norm), but I'm not fulfilling the requirements of the third layer of the Food Pyramid, either. Last night, my concession to green would have been nori seaweed, because I was planning to make spicy tuna hand rolls (sans cucumber). As it happened, Jamie didn't have any tuna so my second choice dinner was steak tartare (you see the pattern here, right? Least amount of work? Food so raw it makes Roxanne Klein’s cooking seem overdone?). I suppose you could count the onions as a vegetable. “These aren’t from a tree are they? You aren’t trying to trick me, are you?” Yes, that’s what I do: I make food for giraffes and trick people into eating it. Salads have come a long way since the days of iceberg lettuce. I think I’ve eaten iceberg maybe 3 or 4 times in my life. That’s because Mom came from a culture which emphasized raw, crisp greens (thank God), so we grew up eating Romaine, Bibb, Boston, radicchio, endives and the like. My friend Julie recalls that the first time she ever ate dinner at my house, Mom made a Boston lettuce salad – Julie was enthralled. Upon returning home to her parents’ house, she asked them, “Have you ever heard of this? Have you ever eaten it?” They hadn’t, but after eating a salad she made from those ingredients, they became – and still are – converts. In 1986 when I was living in the south of France, my aunt took me to the grocery store and introduced me to Salade Minute. It was a novel concept: pre-washed, packaged salad. Earthbound Farms, one of the largest organic produce companies in the States, introduced the salad-in-a-bag in select U.S. markets in 1986, but the concept really didn’t take off until the early 1990s. Alice Waters is one of the acknowledged trailblazers for organic, local foods at a time when most Americans had forgotten what non-canned peaches tasted like. It was she, at the famous Chez Panisse in Berkeley, who popularized mesclun. Mesclun originates from the South of France and includes very young leaves of endive, dandelion, arugula, mache (also known as “lamb’s lettuce,” and I’ve heard it referred to as “lamb’s tongue”), oak leaf, radicchio, chervil, frisee, sorrel and other distinctive wild plants. It’s the same stuff I ate in 1986, except produced domestically. It’s known as a spring salad mix in most stores (mesclun sound too similar to a popular drug?). At the Santa Monica Farmer’s Market, I always get edible flowers with the mix, which makes for one of the most gorgeous salad plates imaginable. My favorite way to eat mesclun is with fresh raspberries and gorgonzola cheese with about 3-4 tablespoons of raspberry vinaigrette. I’m a big believer in less is more with vinaigrettes. 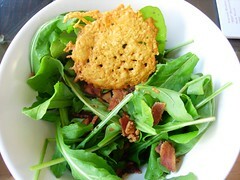 Just toss the mesclun into a bowl, drizzle with vinaigrette and use your hands to mix well. Serve salad on a chilled plate, top with raspberries and crumbled sweet gorgonzola. I like Belgian endives chopped and served with hearts of palm, tossed in a homemade Ranch-style dressing. It’s sharp, distinct, bitter, and smooth, all at once. Some chopped hardboiled eggs really add to the flavor. Insalata Florentine, was served at my wedding. The wedding caterer liked the recipe (which came to me by way of Peggy & Sunil, who brought the recipe back from Florence) so much he’s now included it in menus for prospective brides and grooms. Cut 1 zucchini and 1 yellow crookneck squash into thin strips or julienne using a mandoline. Pat dry with towels (you don’t want wet squash). Toss with 2 T white truffle oil, fresh ground pepper and freshly grated Parmigiano. Add more Parmigiano or pepper to taste (don’t salt: the cheese will provide enough of that flavor). Baby arugula tossed with olive oil, a few spritzes of fresh lemon juice and fresh ground pepper is about as perfect as you can get. I like this salad best just before pizza, or a pasta meal with heavy red sauces like Bolognese. In all cases, I don’t add vinaigrettes or dressings to the salads until I’m ready to serve. Wilted salads just don’t do much for me. I know it seems obvious, but I’ve eaten more than my share of soaked, wet, darkened greens that bear no resemblance to a lettuce. I don’t think anyone should wince when they’re eating salad.